I came across this horn worm on our grapes this morning. There were over 2 dozen white objects attached to its body. It had been parasitized by another insect, most likely some species of wasp. These types of wasps reproduce by depositing their eggs with their stinger into a host insect. In this case the unsuspecting insect is a horn worm. The eggs soon hatch inside the caterpillar’s body. The newly released wasp larvae then begin to feed on the “innards” of the host insect while it’s still alive. 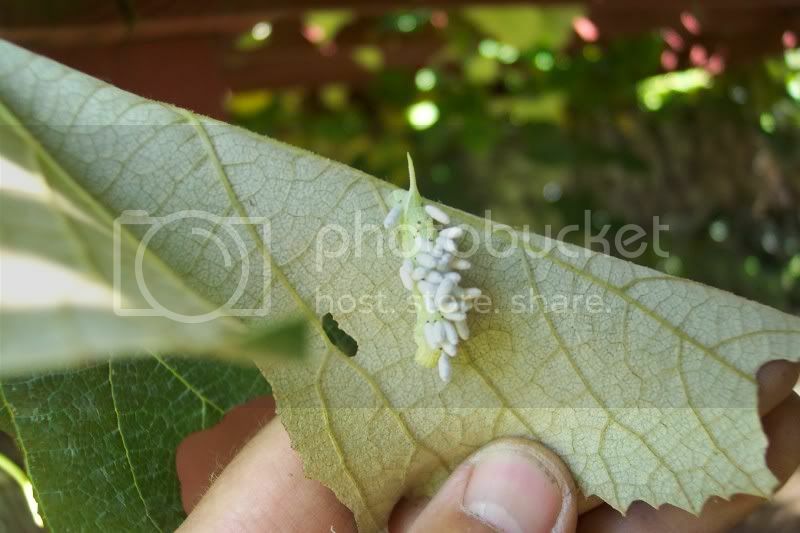 When the young wasp larvae have grown to sufficient size, they form”cocoons”, those white structures you see on the back of the caterpillar. The wasp larvae undergo a transformation inside the cocoons and emerge as fully developed wasps. You can see by the size of the cocoons that these wasps are tiny compared to the paper wasps or hornets we normally see buzzing around the picnic table. Let the balance of nature help you in your garden. When you see a caterpillar that looks like this, don’t squash or spray it, let the new wasps be “born”. They will soon be flying around looking for more caterpillars in your garden to parasitize. By the way, this type of wasp does not sting or disturb people. If you didn’t make it out to fair yesterday (Wednesday), you’re too late! The Monroe Evening News hosted a “Meet the Bloggers” evening in their County Fair booth. It was a good chance for readers and bloggers to talk to each other face to face. So, if you missed us, plan on catching us next year. In the meantime, there’s still plenty of time left to enjoy the fair. Stop in and see the folks at the News anyway. Their booth is just a couple of spaces away from the historic flowing water faucet in the MBT Expo Center. I hope many of you are enjoying the Monroe County Fair. If not, you better get out there soon because fair week is about half over. My how time flies! Which reminds me, Judy and I will be at the Monroe Evening News booth on Wednesday from 6:00pm to 9:00pm or so. We will be joining other bloggers from “blogsmonroe” for an evening of meeting with you, our readers, in person. Judy and I hope to see you there.